Residents of Technopolis wear armor to survive, but Tony Stark's brother Arno has turned his Iron Man armor into a weapon of pure destruction. As weird as it seems, this Iron Man 2020 is not the same as the Iron Man 2020 we reviewed before. That was Arno Stark, the Iron Man of an alternate future. This is Arno Stark, the Iron Man of an alternate present. Arno was introduced to the 616 reality as Tony's brother shortly before the new Secret Wars, and this figure is based on the Armor Wars domain. But thanks to the new belt and shoulder-gears, he looks like whichever IM2020 you want him to be. His helmet is the same Classic Iron Man wore, though his face isn't sliding off it. The face is painted with narrow eyes and angry teeth, and if you remove the helmet, you'll find a stern look and a Snidely Whiplash mustache. Obviously, the set includes a piece of black hair for him to don so the toy need not be bald. In the Perfection region of Battleworld, the intelligent android Ultron has dispatched his drones from the future to exterminate all human life. You may be able to surmise that the "Perfection" domain is based on the Age of Ultron story (comic, not movie), what with the mention of Ultron ruling the world from the future and all. It, along with zones based on Marvel Zombies and Annihilation, were separated from the rest of Battleworld by the Shield, a giant wall which kept their respective threats from destroying everything. 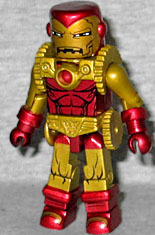 This Minimate uses the head from the movie's Ultron Drones (with sculpted antenna dealies on the sides), a waist extender, and add-on feet and arms. A complicated tampo covers the front of the figure, plus the outsides of the legs and the upper back. This set was available both in Series 64 of the regular series, and as part of TRU Series 21. It includes an exhaust cloud flight stand that either figure would look fine using. This entry was posted in Art Asylum, Marvel, MMMR and tagged Avengers, Iron Man, Minimates, Secret Wars. Bookmark the permalink.